My daughter has narrow feet so she must deal with limited options when it comes to purchasing shoes. But that doesn't stop her from dreaming. She likes flashy even when it comes to sneakers. If she could somehow figure out a way to make it happen, all of her clothing and accessories would sparkle. So, when a new, sparkly book called Shoe-la-la! arrived in our mailbox last week, she snatched it up with glee. 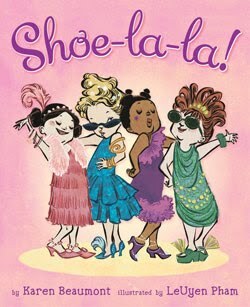 Fancy Nancy, Pinkalicious and now Shoe-la-la ... her glamour girl books. At the corner of Hightop and Oxford streets sits a fancy shoe store called Shoe-la-la with aisles and aisles of shoes galore. Four little girls -- Emily, Ashley, Kaitlyn, Claire -- have a party to attend and need shoes to match their fancy outfits. They decide to visit the posh shoe palace, each in search of the perfect pair. A mountain of shoes piles up, and they have a splendid time as they try on pair after pair after pair, ones with leopard spots to shoes with taps. But, they never find exactly what they need and leave empty-handed, much to the frustration of their exhausted salesman. Undaunted, the children-turned-designers use their imagination and crafty talents to fashion their own fabulous party footwear. With all the glitter on the cover and all the dress-up fun inside, this one is a not-to-miss for every little girl. Shoe-la-la! comes with a full seal of approval from my daughter. The rhyming verses make it a supremely fun read-aloud (wouldn't expect less from the brilliant Beaumont -- love Ain't Gonna Paint know More! & now love Shoe-la-la!) and the text is short and interesting enough to keep the attention of toddlers on up to early elementary. LeUyen Pham's illustrated array of shoes is dizzying! My daughter delights in picking out her favorites from all the piles. She'd be in heaven if she could try them on herself. Pham gives the four multicultural girls their own distinctive styles and personalities. And, her drawings make it easy to get swept up in the girls' enthusiasm for shoes. Even my toddler son can't resist. Not to be outdone, my kids decided to fancy up some shoes of their own with this homemade slipper craft. For the sole of the shoes, I traced the shape of their feet onto pieces of craft foam paper and cut them out with a scissors. I then cut out half circle pieces of foam to use for the top of the slipper. I sewed the shoe tops and bottoms together by hand (it didn't take long and I wasn't fussy about being neat). The kids took their perfectly sized slippers and personalized them with stickers, markers and whatever else they could find in the house. The shoe project was hit and best of all, they could try on and model their designs when they were finished, just like in the book! Scholastic has graciously offered to give away (2) copies of Shoe-la-la! Two (2) winners will each get a sparkly book about some fancy shoes! To enter this contest, leave a comment relevant to this post. Or, let me know if you have a favorite children's book about shoes. We're in shoe mode and would love your suggestions. • Contest ends on Monday, January 31st, 2011 at 11:59 PM CST. I would love to get this book for my cousin because she is six and loves to read but she is also the ultimate girly girl. Plus i'm her favorite cousin and I wouldn't want to disappoint her! It says the contest ends on january 31, 2010 so I may be wasting my time but..
A favorite would be "Ballet Shoes" by Noel Streatfeild. I blogged giveaway, tweeted, twitter follow and blog follow! @25kati - Thanks for catching my mistake. The date should be 1/31/11. I'm not used to the new year yet! @LadyD - Thanks for entering in all those ways. I know it's a pain, but to get counted, you'll have to leave separate entries. I use random.org to chose my winners and it picks by number. How sweet! It's not just the girls who love the glitz; my grandson is awfully proud and picky about his shoes, too. I won't enter the contest for him, but I will enter for grand #2, who we will find out soon whether tis a boy or a girl! I follow you and love your posts! I would love this one for my oldest granddaughter...she loves shoes! My 5 month old already loves to look at shoes. This would be a great bedtime book! My 5 year old and 2 year old would love this book! My girls love shoes, and sadly, they don't get that from me! I'm more of a purse girl myself. My husband on the other hand has a closet full...no joke. His tennis shoe collection is just ridiculous! lol. It's not about shoes but my sisters and I loved The hundred dresses by Eleanor Estes back in the day. It's a great easy chapter book! This would be a fun book to read to my preschool class. Thanks for the chance to win! I have three little nieces who would adore this book. This book looks adorable for any little girly girl. It's too early to tell how "princess-y" my little girl will be yet, but I'm sure trying :) I'd love to have this shoe book for her when she's older! 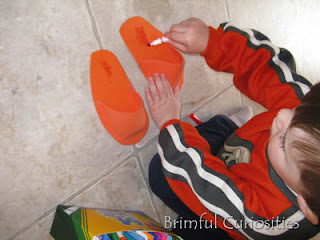 I LOVE the slipper craft too...so creative, I bet the kids had a blast making their own slippers! My daughter and I recently read a book called "Ooh La La Polka Dot Boots" which pretty much said that polka dot boots go with any outfit. Very fun and very cute! Why yes, I would like to enter this contest. We have our own shoe-buying issues here due to high arches. And looking at their feet! I'd love to win! But even if I don't, I'm definitely going to get this one from the library and do your shoe project with my little one. We have so much fun with the ideas you share...thank you! My little niece loves shoes and she would love this book. This looks like a fun book for little girls. I think the craft your children did is pretty neat. Thanks. This sounds like the perfect gift for my niece. She is only four but LOVES shoes. My niece loves shoes so this would be perect for her. I regret that my poor little girl inherited my narrow feet. Shoe shopping is tough! But this book looks ADORABLE! What a clever title! I already follow your blog and on twitter - and I will tweet about the contest too. :) Thanks! I don't believe we have any books about shoes at our house but I could easily see this book becoming a favorite! This book looks so cute. I looked at it a little at our book fair preview and it looked adorable. My daughter would love it. thanks for the giveaway! I have a friend who has a grand daughter who loves to try on Grandma's dance shoes, and any others lying about. The two of them often have days where they do a lot of painting and crafts, so I could just see her making shoes! I would like to win the book for her, Sophia! we had a story about clipclop - ahorse who wanted dancing shoes. This looks like a fun book for little girls. I love the diversity of the character this book appears to have! Plus, who doesn't love a children's book about shoes? The illustrations are super cute and colorful, I would love to add this book to my library! I can't think of any shoe books! Thanks for the giveaway! Thanks for the giveaway! My favorite children's book about shoes is "The Elves and the Shoemaker" by the Brothers Grimm. New follower via GFC (Bornajhawk). I don't have any favorite books about shoes, but I love children's books!! 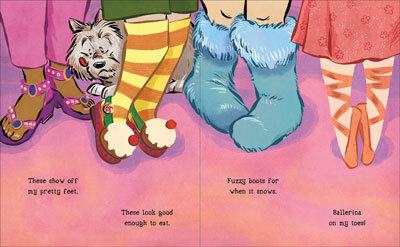 My favorite children's book about shoes is Puss in Boots (Lincoln Kirstein (author) and Alain Vaes (illustrator)). Also Gossie by Olivier Dunrea! Skating Shoes by Noel Streatfeild!